Philharmonic Society of Arlington SPONSORS' CONCERT, Chorale and Philharmonic Orchestra. The Sponsors' Concert will feature the premiere of a newly commissioned orchestral work by Erich Stem entitled “Arlington.” Arlington is the fifth city on Erich Stem’s musical tour of the U.S. In addition, Francis Poulenc’s Stabat Mater, will be performed by the Chorale and Orchestra, featuring acclaimed soprano soloist Barbara Quintiliani. The program will also include the Orchestra’s performance of Vltava (The Moldau) by Bedrich Smetana, and the Chorale’s performance of Ludwig van Beethoven’s Elegischer Gesang (Elegiac Song) op.118. A reception following the concert will be held to recognize and honor our Sponsors who support the organization’s musical activities. We hope you will join us for this concert at the First Parish Unitarian-Universalist Church, 630 Massachusetts Ave., Arlington. Please note that there is on street free parking and a parking lot across from the Church. Also, this venue is wheelchair accessible. Tickets are purchased at the door. Admission is $15; $10 for seniors and students; and $5 for children 17 years and under. 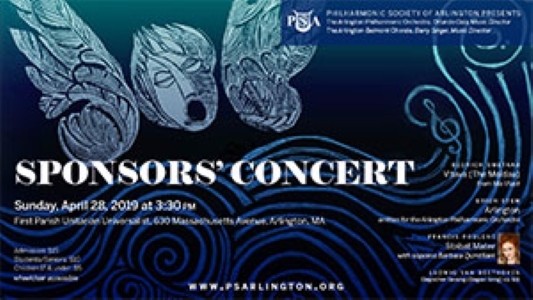 Please visit www.psarlington.org for information about this concert and other PSA musical events. Tickets are purchased at the door. Admission is $15; $10 for seniors and students; and $5 for children 17 years and under. Please visit www.psarlington.org for information about this concert and other PSA musical events. Please note that there is on street free parking and a parking lot across from the Church. Also, this venue is wheelchair accessible. Sign Up to receive alerts!